"Newbie to the forum here. I searched the threads and found a few regarding powerpoint, but they were all kind of old. I’m looking at solutions to put powerpoint presentations on Samsung Galaxy Tab S, but don’t really need to have animation or sound. Just the slides are fine. It looks like that is possible, but I have no idea how to do it or how complicated it is. I’d like it to be quick and easy so if a specific topic comes up I can quickly add that presentation to the tab and discuss it with the interns. Here are the specific questions: How do you play PowerPoint on Galaxy tab s tablet? Do I need to install Galaxy PowerPoint player to play PowerPoint on Galaxy Tab S or convert PowerPoint for Samsung Galaxy tab s?" Many users will take advantage of tablet to watch movies and play games, and some of them may use it for work, such as editing documents, create excels and watch PowerPoint presentations. Speaking of how to play PowerPoint on Samsung tablet like Galaxy Tab S, it becomes very simple nowadays due to the fast development of 3rd-pary PowerPoint player for Android devices. From Google Play, you could get quite a lot of Samsung Galaxy PowerPoint player software to help you play PowerPoint on Galaxy Tab S.
This guide will take Samsung Galaxy Tab S as example to show you detailed information upon Samsung Galaxy PowerPoint player, and solutions on how to play PowerPoint on Galaxy Tab S and how to convert PowerPoint to Galaxy Tab S. You could follow this guide to learn how to play PowerPoint on Samsung tablets freely. The Samsung Galaxy Tab is a line of upper mid-range Android-based tablet computers produced by Samsung Electronics. This Samsung Galaxy Tab series currently include Galaxy Tab 7.0/7.0 Plus/7.7/8.9/10.1/2/3/3 Lit/4/Pro/S/A/E/S2. It is similar to the Samsung Galaxy Note series except without the Samsung S-Pen stylus. The Galaxy Tab S series refers to the ultra high-end models: the Samsung Galaxy Tab S 8.4 and the Samsung Galaxy Tab S 10.5 which are aimed to be the flagship model line of Samsung Galaxy tablets together with other Samsung Galaxy S series devices namely the Samsung Galaxy S5. The tablets were announced during the Samsung Galaxy Premier 2014 in New York. The Samsung Galaxy Tab S rocks a vividly colorful, razor-sharp screen and exclusive software perks in an ultra-thin and lightweight design. An exceptional screen and a long list of software goodies make the Galaxy Tab S Samsung’s best tablet to date and the top Android choice for an entertainment slate. 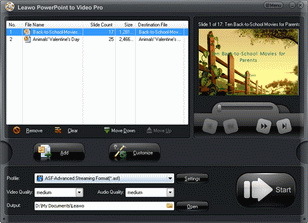 Make use of Galaxy PowerPoint player software. Convert PowerPoint for Samsung Galaxy Tab S.
Since some people may try to convert PowerPoint for Samsung Galaxy Tab S so as to play PowerPoint on Galaxy Tab and other Samsung tablets, it’s neccessary to make clear about the multimedia files supported by Samsung Galaxy Tab S and other tablets. With all video and audio formats supported by Samsung tablets listed above, you could then move further to this guide. The below content would show you detailed solutions on how to play PowerPoint on Galaxy Tab S and other Samsung Tablets. Samsung hasn’t preset PowerPoint player for Samsung tablet users to play PowerPoint on Samsung tablets. The Galaxy PowerPoint player means some 3rd-party PowerPoint player. Some may call such programs as PowerPoint viewers for Android. 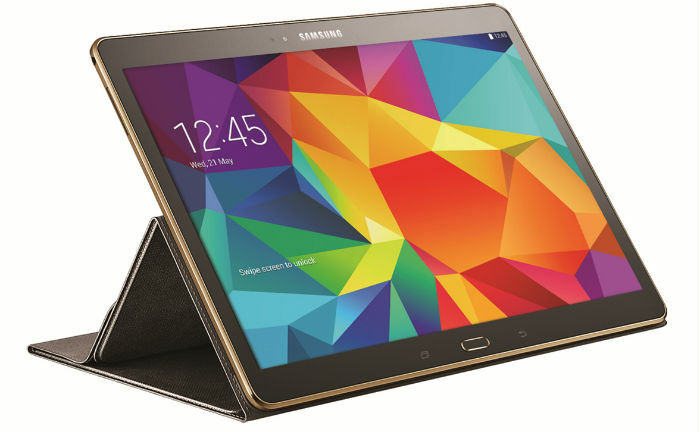 You could get paid or free PowerPoint player for Galaxy Tab S and other Samsung tablets online. 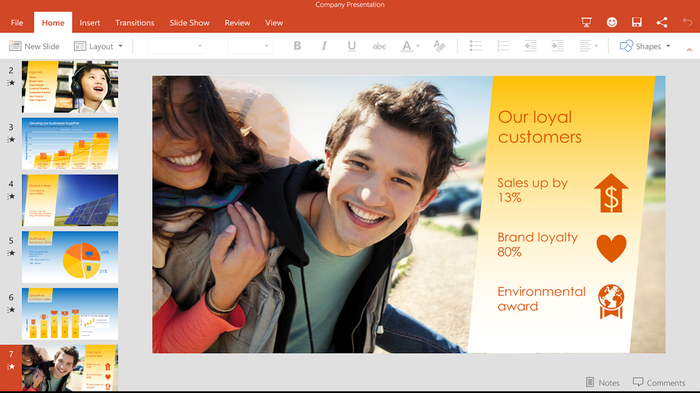 Microsoft has released its own PowerPoint player for Samsung tablets and other Android devices. That’s is Microsoft PowerPoint for Mobile. This Android app allows you to create, edit and play PowerPoint on Samsung tablet with ease. You could even get its upgrade version Microsoft Office Mobile, which offers even more features for you to create, edit and view PowerPoint, word, excel and other office files on your Android devices. But it requires you to subscribe Office 365 to embrace its full features. You could also make use of your Samsung Galaxy Tab S’s default media player to play PowerPoint on Galaxy Tab S by converting PowerPoint to Galaxy Tab S video with PowerPoint converter or other tools. In this way, you don’t need to install 3rd-party PowerPoint player, but work with your computer. It becomes much safer and easier. There are 2 ways to convert PowerPoint to Galaxy Tab S video: use either Microsoft PowerPoint or 3rd-party PowerPoint converter. Open your PowerPoint file and navigate to the "File" menu. Open the "Export" tab and then click "Create a Video" option. 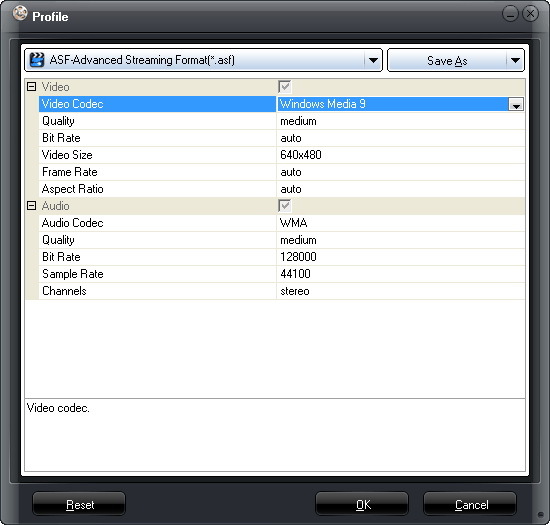 On the popup "Save as" interface, set output video name and determine output format from MP4 and WMV. 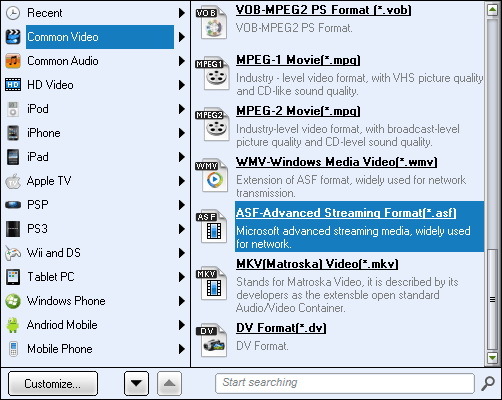 Meanwhile, select a folder to save output video file. Click "Save" button to start converting PowerPoint to video within MS PowerPoint. Besides using MS PowerPoint 2010 or later versions to save PowerPoint to Galaxy Tab S video in MP4 video format, you could also use 3rd-party PowerPoint to video converter to help you convert PowerPoint to video in MP4 or other formats that are accepted by Samsung Galaxy Tab S. With a PowerPoint to video converter, you could not only convert PowerPoint to MP4 for Samsung tablets, but also add some special effects to PowerPoint files before converting. 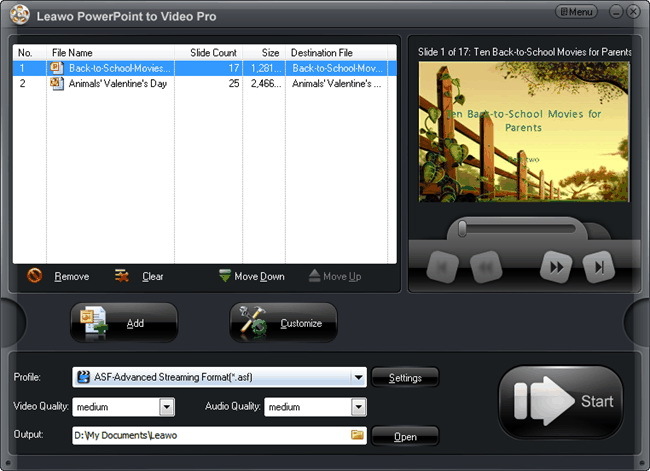 Among all the PowerPoint converter programs, Leawo PowerPoint to Video Pro offers you the best solution to help you convert PowerPoint to video in MP4, WMV, FLV, MOV, AVI, MKV, etc. for multiple media players and mobile devices. With Leawo PowerPoint to Video Pro, you could easily convert PowerPoint for Samsung Galaxy Tab S.
Download and install this PowerPoint to video converter software on your computer. Get source PowerPoint files ready. Then follow the below step-by-step guide to learn how to convert PowerPoint to Galaxy Tab S videos. 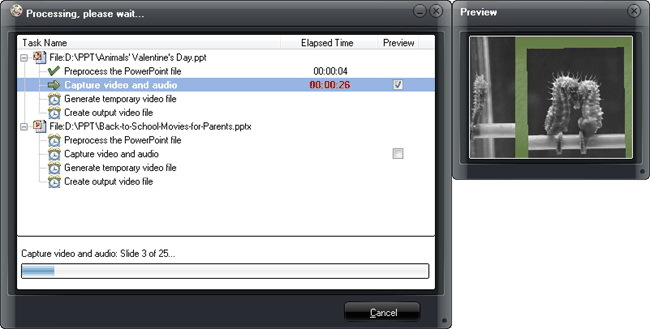 Run Leawo PowerPoint to Video Pro, and click "Add" on the main interface to browse and import PowerPoint files. Next, open the "Profile" box to set output format. You could choose a format from "Common Video" group. Make sure the format you select is included in the above table of Samsung Galaxy Tab S multimedia specs. Meanwhile, set output diectory in the "Output" box. According to your Galaxy Tab S multimedia specs, you could adjust video and audio parameters like video codec, bit rate, video size, aspect ratio, frame rate, audio codec, channel, etc. of output profile. This would let output file meet your tablet exactly. Click the "Settings" button to do this. 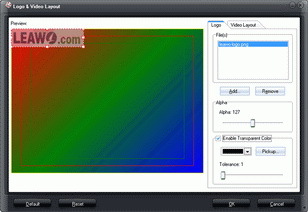 If you want to add some extra elements to output PowerPoint video like setting PPT transition time, adding PPT background music, setting audio effect, setting aspect ratio, adding watermark, etc., you could click the "Customize" button on the main interface. Finally, return to the main interface and click "Start" button at the right bottom right corner. This PowerPoint to video converter would start to convert PowerPoint to Galaxy Tab S video. After conversion, your PowerPoint files would be saved in video files that could be recognized by your Samsung Galaxy Tab S. Connect your Samsung tablet to computer via USB cable, transfer the converted PowerPoint files to tablet, then you could play converted PowerPoint on Samsung Galaxy Tab S freely.